Dry texture sprays are all over the place at the moment, and I for one am keen to try each and every one of them, as my hair has a tendency to fall flat and limp 10 minutes after I've styled it. Ball ache! No matter how much hairspray I use, the volume just will not hold at the roots. I was over the moon when these kind of sprays were introduced, as they add grit and texture which allows the hair to be styled much easier and keeps the hold a lot more. 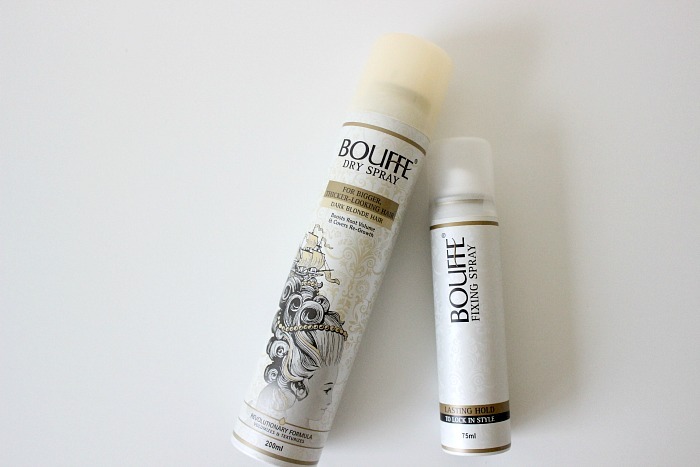 Bouffe is one of the latest brands to arrive on the scene, and I was very kindly sent two of their products to try and review. 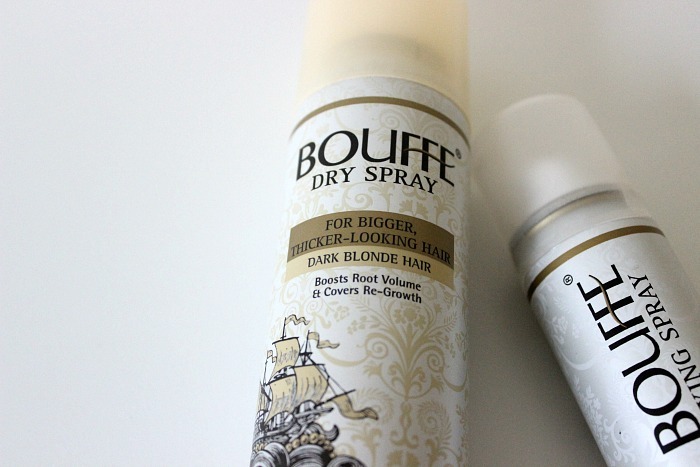 First up is the Bouffe Dry Thickening Spray for Dark Blonde Hair*. They do a range of different shades to suit hair colours in order to cover root re-growth, aswell as a clear one for those who simply want a dry texturising spray without additional benefits. I think this is a genius idea, as having blonde hair, it's not very often I don't have a bit of root colour showing, so to find something that offers to cover it up in between salon visits is a big deal. I found this product to perform really well in terms of giving volume. In fact, I'd say it's actually one of the best I've tried as it really does double the volume at the roots, as well as giving added grit and texture to the lengths and ends of the hair. In terms of covering re-growth, I think it definitely helps, but I wouldn't want to go overboard on it as I think it could have a tendency to go a little bit on the yellow side. The formula itself is a little heavier than other texture sprays I've used, but nothing too drastic, just took a couple of uses for me to get used to the heavier matte finish. Overall I would definitely recommend this product to those with fine hair that lacks grit, and I think next time I'll go for the clear version to see how that differs. 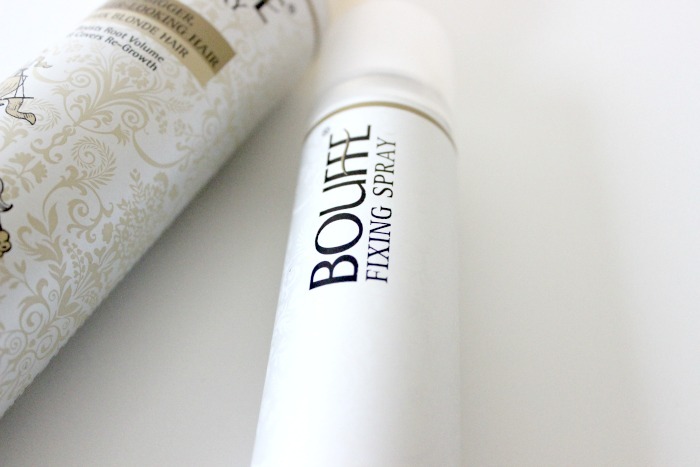 To use alongside the Dry Spray, I also received the Bouffe Fixing Spray* which aims to act as a finishing touch spray to hold in the texture and lock in the colour. As a hairspray, this product works very well in keeping my hair in place, especially at the roots. I think that's where I was going wrong all those years, I was trying to use hairspray to create the volume, whereas it's actually meant to hold it in place once it's been created. In terms of sealing in the colour, I haven't really noticed if it does this, as I think this would be a lot more noticeable to those who use the darker colours. I like that it's a nice travel friendly size too - who wants to carry around a big beastly hairspray on a night out? (not that the pregnant me ever has a night out these days, lol). Have you tried anything from the Bouffe range?